For more than 100 years, every Ferris wheel on the planet was roughly the same size and height as the 1893 original. But in 2000, something changed: London debuted the London Eye, an enormous juggernaut of a tourist trap. Its success sparked a global race to build higher and faster wheels in the sky—and it's only heating up. So who's winning? For 100 years after it debuted at the Chicago World's Fair in 1893, the Ferris wheel was nothing more than a folly on the urban landscape. This feat of engineering intended to "out-Eiffel Eiffel" but was still perceived as a carnival ride, relegated to amusement parks, shopping malls and smarmy boardwalks thick with taffy and funnel cake. In 1999, the world's tallest Ferris wheel rotated a mere 377 feet above Tokyo, which was only a slight innovation: the original had reached 263 feet a century before. Then the London Eye came along in 2000. At 443 feet, it rather triumphantly claimed the title of tallest in the world. It accommodated 800 passengers at a time, who rode in 32 cushy capsules high above the Thames, not at some theme park. The London Eye was a critical and cultural success. Suddenly, the now-named "observation wheel" had been transformed into a civic icon, a symbol of urban progress—that just happened to turn a hefty profit. And cities around the world wanted their own little wheels of fortune. Six years later China's Jiangxi province had surpassed it with the 525-feet-tall Star of Nanchang, and only two short years later, the Singapore Flyer reigned supreme at 541 feet. From 2000 to 2008, the wheel had claimed another 100 feet in elevation. In 2011, Las Vegas, that bastion of understatement, announced The High Roller, eeking out the Singapore Flyer by just few feet. The wheel is currently a half-moon under construction as part of the massive Linq development on the Strip. But hold up there, Vegas! 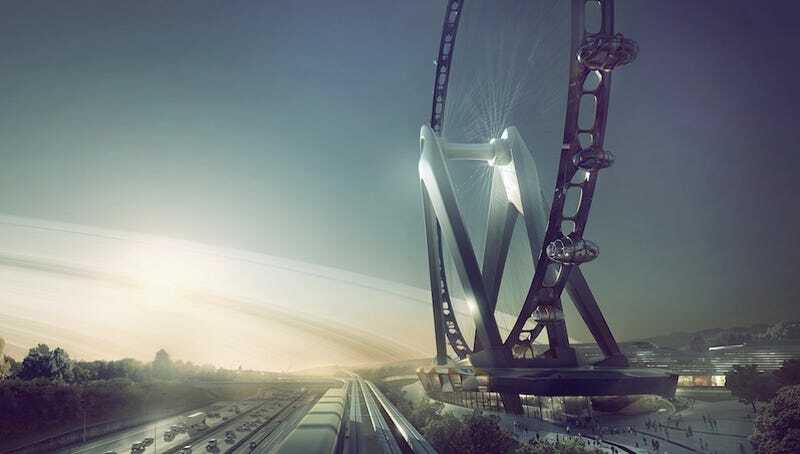 The New York Wheel, which received community approval earlier this year to rise on Staten Island, saw the High Roller's bet and raised its height to a stunning 625 feet. It seems that all this wheeling and dealing has given Japan the itch to reclaim its title with the Giant Observation Wheel (aka Nippon Moon), which was announced this week for a secret location. The height has also not yet been disclosed, but if the renderings are to be believed, it's only slightly smaller than the actual moon. But for real, according to the Dutch firm UNStudio: "It's almost twice the scale of the wheel in London." Let's say, conservatively, that would make it 800 feet tall. That's good enough for us to declare a winner. JAPAN IS BACK ON TOP!!! Why is everyone so excited about going in circles all of a sudden? And more importantly, have we reached Peak Wheel? While we've always liked to stand on top of tall buildings and gaze out over the grid below, the observation wheel has seemingly supplanted the observation deck as the must-have for a big city. One major reason is likely a safety issue. While we'll probably always be able to mount the Burj Khalifa for kicks, after 9/11 it's tougher to rationalize shuttling millions of people through a busy office building just to look. Observation wheels still have massive security, of course, but they're practically transparent and have slender footprints that don't take up much space. And that's the other thing: Wheels are good branding. They add a distinctive flair to the skyline that's aesthetically much more interesting than the typical spire. And they're playful in a nostalgic way that appeals to the masses. London: We're Fun, We Swear!™ Observation wheels signify a blissful celebration of a city, a permanent World's Fair, if you will. George Washington Gale Ferris, Jr. would be proud.